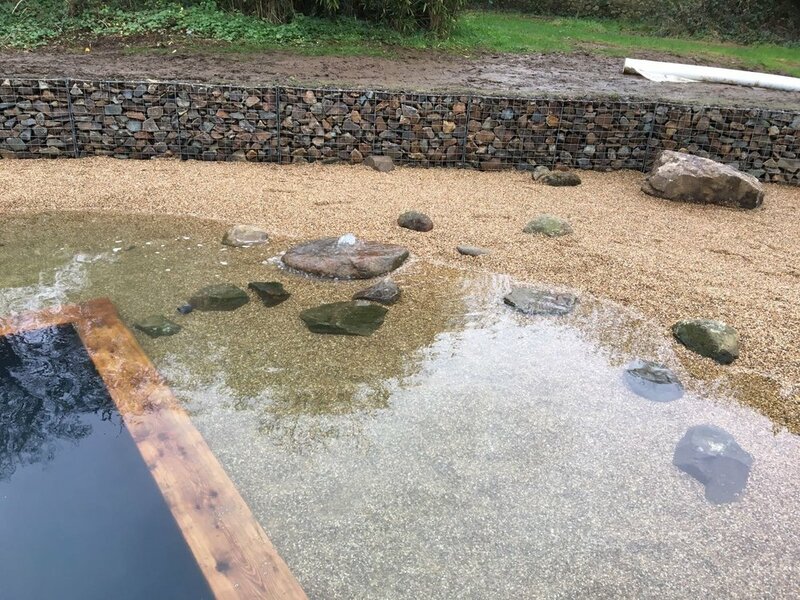 Set in the middle of an old, walled garden, we have combined the organic simplicity of this Natural Pool with its ecological build to create an oasis for our client to retreat to. This Natural Pool is situated in South West Wales, in a sloping, walled garden surrounded by high stonewalls and full of wild flowers, that reminds us of The Secret Garden. Our client wanted an ecological build with minimal concrete and the where possible to use local materials. 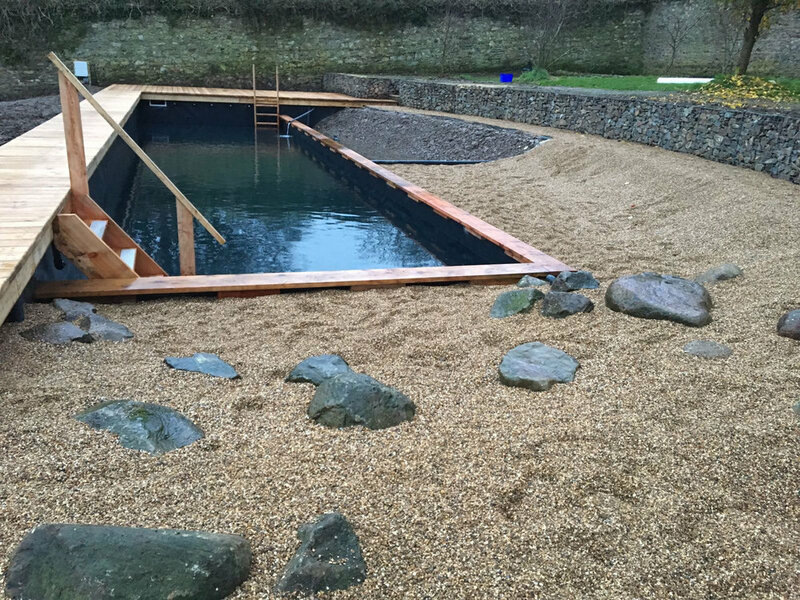 The pool, 16m long and 4m wide, with a shallow end and additional sloping beach, and is designed for swimming lengths. It has a Deep Regeneration Zone to one side and a sun deck overlooking the deep end – perfect for relaxing or diving into the water. A deck walkway runs down the other side of the swim zone, giving easy access to the water. Water flows back into the pool via jets on the beach and from a drilled boulder, which was found on site. The sloping beach spills out onto a dry beach, planted with creeping thymes and alpines including Thrift- this pool is only a stone’s throw from the coast where such plants thrive on the cliff tops. 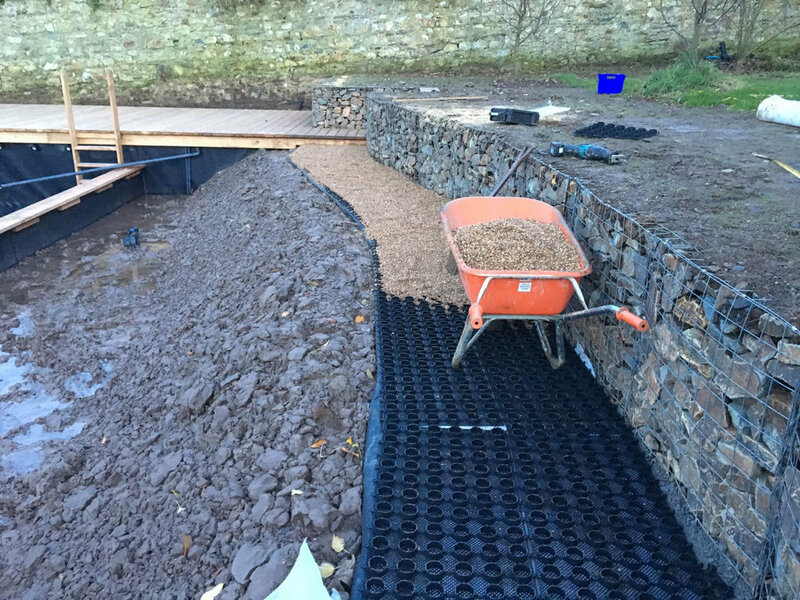 We have retained the grassy orchard sloping up behind the pool with gabions filled with local stone to match the garden walls. The bank below the pool is planted with a matrix of grasses, perennials, herbs and wildflowers, to create a rich, floral tapestry, reminiscent of a naturalistic wild flower meadow. This bank will support wildlife in and around the water including amphibians, voles, bees, butterflies and birds. We are pleased with how the pool and garden come together, in keeping with the wild, naturalistic spirit of this special walled garden.